1. Make peanut sauce by heating olive oil in a medium skillet and sautéing the onion until tender. Add the remaining ingredients, stirring over low heat until blended. Additional broth can be added if sauce is too thick. 2. 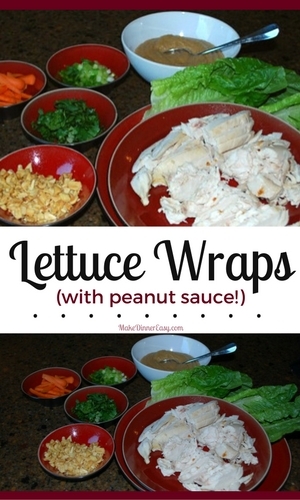 Arrange chicken, lettuce and vegetable on a platter. Place cilantro and chopped peanuts in separate small bowls. 3. 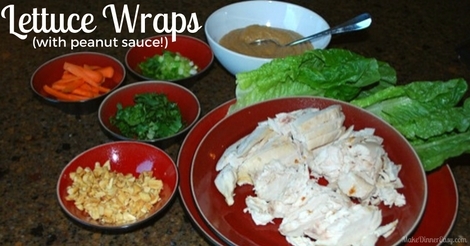 Serve by placing a desired amount of chicken and vegetables on a lettuce leaf and top with cilantro and peanuts. Spoon a small amount of sauce on top. Roll lettuce up burrito fashion. Want to make this on another day? Pin it for later! Click on any of the images below to see what I've pinned to Pinterest recently!. If you like to see the recipes and cooking tips that I discover and pin, I'd love to have you follow me on Pinterest! Visit Crystal@makedinnereasy's profile on Pinterest. 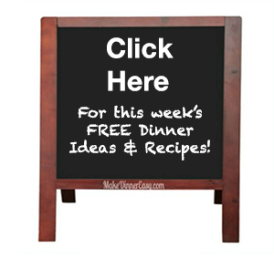 Each week (usually on Mondays) I send out an e-Newsletter to over 11,000 people with a link to the free dinner menus and printable grocery list that I've created for the week. You can Sign Up for the Newsletter (it's free) to be added to my next mailing. Facebook. Twitter. Google+, Pinterest, and Instagram. I'd love to have you follow along! Each page on this site has a comment box, so if you want to share how a recipe turned out or something you added to make it even better, feel free to comment below!